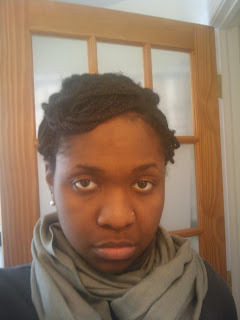 I had a conference to attend for work and wanted to do more than my usual winter 2-strand twists. This style was absolutely elegant, I loved it! I got tons of compliments and would definitely rock it again at a wedding, work, or on the weekend for fun. 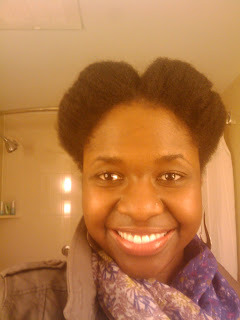 The style was very similar to the Cinnabun style, with a little Shingai-inspiration since I did not pull it back. I had a total of 8 rolls, 4 on each side, with a part down the middle. I don't think the pictures capture the essence of the style.I think I'll try this style again without a part down the middle to change it up. Tutorial: I did this style on blow-dried hair, however it would work equally well on stretched hair. Part hair down middle (optional). Part hair horizontally into four sections (*eight if you did the center part). Gather each section at the end and pin each section back. Use bobby pins or hair pins to hold. 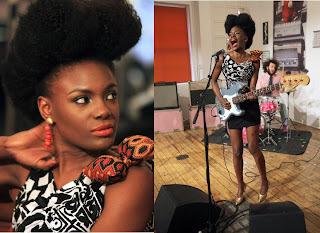 I've had the "I'm bored with my regular styles" itch and have tried a number of new styles like 3-strand twists (post to come on this one), Shingai-inspired style (post to come) AND I did a Janelle Monae-inspired style!!! 2 out of 3 were FABULOUS!!! 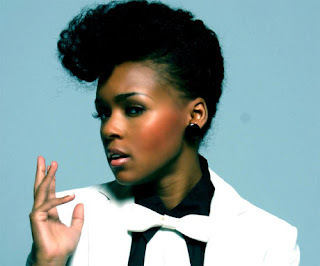 I'll highlight the Janelle Monae-inspired style in this post. NOTE: I CLEARLY don't have as much hair as her, it was extremely difficult pulling the back of my hair together into a french roll type of flat twist. 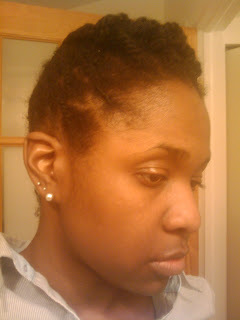 I will probably wait to try the style again until my hair is longer. However, it was pretty cute for a first-time try. I used A LOT of bobby pins to pull this style together. 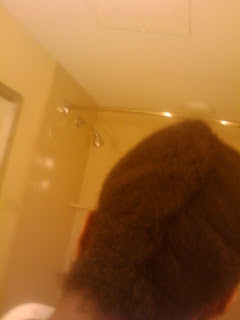 Like I said above, it was difficult pulling the look together with my current length. 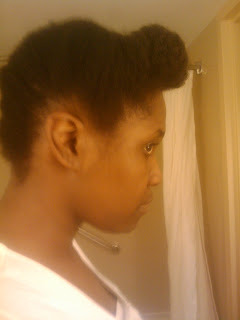 I did this style on blow-dried hair. I would give a tutorial, but it was so difficult for me to pull this together, I don't feel that I am properly equipped to officially gives tips on this one. I do however, have a suggestion for a youTuber who gave a good tutorial for the style, check out Karleo82's tutorial here. This was a great new funky style for me! 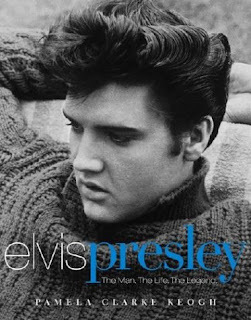 Is it just me...or is this taking you back to Elvis Presley??? While I was rocking the style, I thought about wearing it for a work conference, but thought it would remind my co-workers too much of Elvis, so I opted out. One of my favorite natural hair blogs, Black Girl with Long Hair, suggested some natural hair group definitions for fun. 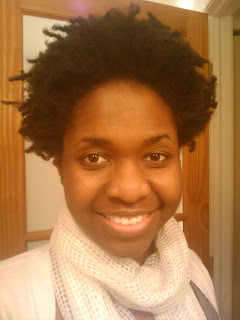 Check out BGLH for the original post on types of naturals here. I haven't blogged on my "Build Your Wardrobe (BYW)" portion of my blog in a while. I gave Tip #1 at the end of 2009, which was - Know Your Body! Tip #2 helps you shop like a pro, and that happens by you...Defining and knowing your style. In my first BYW post I mentioned that I did not have a wardrobe, instead I had individual pieces that did not go well together. I have avoided this by defining my own personal style. This allows me to shop efficiently. There are two parts to this for it to work well - know your style and have a general color scheme in mind. Defining and knowing your style can be difficult...after all you have SO MANY OPTIONS! Check out magazines, websites, the Good Will and blogs for style inspiration. If you like something, circle it, cut it out and check your current wardrobe to see how you can create the look and work from there. Ask yourself, what image do I want to portray? Business? City-shique? Bohemian? Fun and flirty? You also MUST keep your body in mind when looking for styles. You need fit for any item to be an integral part of your wardrobe. 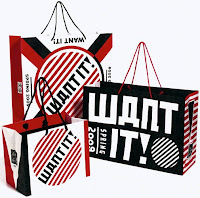 You also want to keep colors and patterns in mind when shopping. For starters, ask yourself, what colors look good on me? What colors do I love? How do the colors tie in to my overall look? If you see a fabulous bright-orange silk blouse, but your wardrobe has lots of earthy grays, blues and blacks, the orange blouse may not give you a lot of "bang for your buck." You can get it, just recognize that the blouse may not get a lot of wear. This is something you definitely want to keep in mind if you're shopping on a budget! Originally, I was not going to post anything about this style. However this style warranted me some unexpected compliments, so I felt the need to share :)! Let me also mention that my twists were nearly one-week old at this point, this was a great "change-the-game" mid-week style! 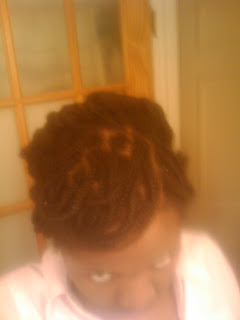 Tutorial: Plat small-medium sized two strand twists all over your head. 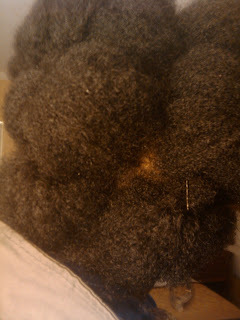 Section off all of the twists in the front-center-half of your head. Check out my 'Top' pic view for an idea of how much to section off. 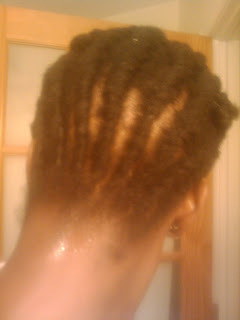 Take the twists at the top and plat a large flat-like twist toward a side. Pin the twist down with a bobby pin. 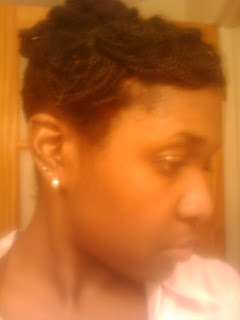 * Pull the rest of the twists into a bun with an ouchless band. 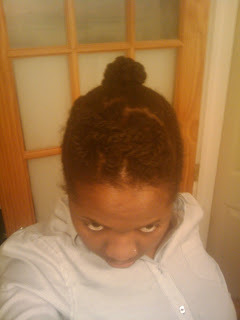 *If hair is longer, put the remainder of the twist into the bun. With all this snow out...I have some extra time to surf the net for some of the things I love (natural hair being one of them). 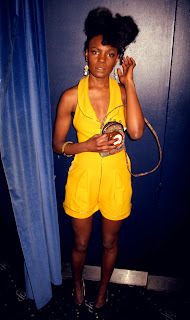 My cousin originally told me about fashion mogul/singer/artist Shingai Shoniwa, and now, I feel the need to share the fabulosity of this woman with all of my followers. 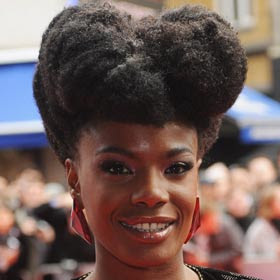 Check out more information on her group, The Noisettes here. I am SOOOOO happy that the Saints won the Superbowl yesterday. I said WHO DAT?!?!?! 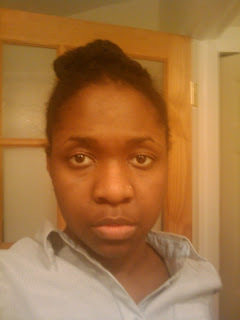 Ok, now back to the real item of the hour, my newest style...a 50's-inspired pin curl style. Sidenote: I really don't know what era this style inspiration came from, I really saw a little girls' hair from watching Boyz n the Hood and used that for inspiration and worked from there, lol, SMH! 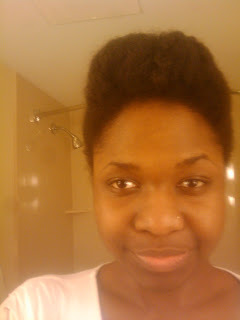 50's-inspired sounds better than 'Boyz n the Hood' Inspired...LMBO! Ok, enough pics! I thought it came out pretty cute. Not sure that I love the back, but I do like the front. 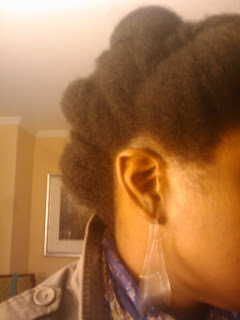 I think I will take out the back to replace the flat twists with box braids tonight and pin curl the braids in the back. Tutorial: Part hair in half across the center of your head. 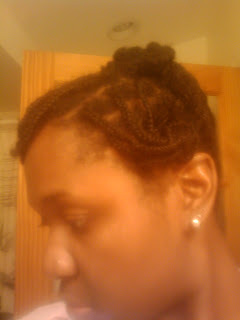 Plat box braids in the front section. Flat twist the back section up towards the middle of your head. Take the excess from the flat twists to make one large twist across the top of your head. 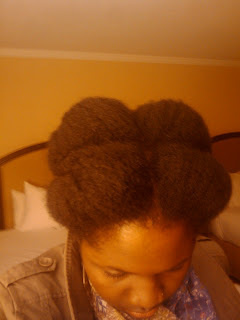 Pin-curl sections of the braids - I pinned three sections on the fat side and one section on the skinny side. Use a bobby pin to secure the curls. We've gotten 20" of snow in Philly so I've been cooped inside, watching movies with my boo and just chillin' - it's been great! My cousin sent me a link to this GORGEOUS Barbie doll. She looks like she could be natural with her short pixie cut. Just thought I'd share since I liked it :). WORK Black Barbie! Here's a link to the original site where you can purchase the doll and check out other Barbie collectors' items.